This article is about the 2010 video game. For the 1998 video game, see Need for Speed III: Hot Pursuit. Need for Speed: Hot Pursuit is a 2010 racing video game developed by Criterion Games and published by Electronic Arts for PlayStation 3, Xbox 360, Wii, Microsoft Windows, iOS, Android, webOS and Windows Phone. The Wii version was developed by Exient Entertainment. Hot Pursuit is the sixteenth Need for Speed title and was released in November 2010, with digital distribution versions released within December 2010. Hot Pursuit's gameplay is set in the fictional Seacrest County, which is based on California, in which players can compete in several types of races. Players can compete online (except in the Wii version), which includes additional game modes such as Hot Pursuit, Interceptor and Race. The game features a new social interaction system called "Autolog", which is a network that connects friends for head-to-head races and compares player stats for competition. The game also features paid downloadable content in the form of new cars, new race and pursuit events, and new trophies and achievements. Hot Pursuit was well received by critics at E3 2010 and was most notably awarded with "Best Racing Game" from the 2010 Game Critics Awards as well as several other media outlets. It won several Best Racing Game awards, including Best Driving Game at the Spike 2010 Video Game Awards. The game also won a BAFTA Award for its Autolog multiplayer component. Hot Pursuit goes back to the Need for Speed series' roots and takes on the gameplay style of earlier Need for Speed III: Hot Pursuit and Need for Speed: Hot Pursuit 2 titles in the Need for Speed franchise with exotic cars and high-speed police chases. Hot Pursuit lets players be either a racer or a police driver, and features a full career mode for both roles. The relationship between the cops and racers is described as "a dog chasing down a rabbit"; the police being more powerful while the racers are faster. Each side has several power-ups including calling for roadblocks and radar jamming. According to Criterion the single-player section is somewhere between 12 and 15 hours long, but with lots of replay value. The game takes place in a fictional location known as Seacrest County based on Southern California, Arizona, and Colorado. It's an open world and features over 100 miles (160 km) of open road, four times larger than that of Burnout Paradise, Criterion's previous title. Hot Pursuit features a new social interaction system called "Autolog" which is described as "Facebook for the game". The game features both single-player and multiplayer game modes with up to eight players; as an option to live multiplayer racing, players can post records and achievements on the Autolog feed for friends to see, which they then can try to beat. Autolog also contains an experience system called "Bounty". As of July 2012, the Web Dashboard for Autolog was shut down for all games, except Need for Speed: Most Wanted. The driving mode of the game is described as "fun, accessible, okay", however not as arcade-styled as Burnout Paradise, but far from a simulator. All vehicles in Hot Pursuit are licensed real-world cars and SUVs, described as "all the cars you dreamed of driving, in the way you dreamed of driving them". Most vehicles are available in both racer and police variants, but a few cars are exclusive to each side. Also exclusively featured in the Hot Pursuit is the Porsche 918 Spyder. Ferrari however, last seen in a Shift DLC-pack but notably absent from all other Need for Speed games since Hot Pursuit 2, is also absent from Hot Pursuit. There is no car customization or tuning, other than color changing, "just because the game really focuses on the Hot Pursuit element." Unlike previous Need for Speed games which use unbranded, fictional models, real cars like the Audi A4, Chevrolet Cobalt, Porsche Cayenne, Nissan Frontier, and Ram 1500 are used as traffic cars. The Wii version of Need for Speed: Hot Pursuit has very little in common with its Xbox 360, PlayStation 3 and Windows counterparts. This version was designed by a different company (Exient Entertainment), and was a completely different game in nearly every virtual aspect: graphics, soundtrack, racing modes, gameplay, and customization. Some reviewers cited that the Wii version showed stark similarities to a previous Need for Speed installment, Nitro. This version takes place in four real-life cities across the world, as opposed to the fictional Seacrest County in the other versions. In Career mode, there are 4 super-tournaments (each city) and a Grand Prix Tournament. Each super-tournament consists of four smaller tournaments, which consist of Hot Pursuit (circuit with cops), Eliminator (knockout), Time Marker (solo timed circuit) and Rush Hour (100 to 1) races. Each super tournament concludes with a Boss Race, which is a free roam race (with GPS) to capture more of the checkpoint flags than the Boss (2 out of 3, etc.). Besides Career, the game offers Quick Race mode, which allows up to four players on split screens, each with their own map, and the four race types from Career plus a fifth, "Interceptor" (be a cop & bust a speeder). The cars, purchased with Bounty, improve in speed, acceleration, and strength (D, C, B, A, and S Class cars, plus police vehicles in the Quick Race's "Interceptor" race). Racers do not have names, just the Career/Profile names. During the race, players can accumulate and use regular nitro and super nitro (more powerful but shorter), similar to Need for Speed: Nitro. Power-ups/"Supes" are acquired while driving: Boost (extra nitro), Drain (others' nitro), Cruise Control (brief auto-steering), Deflect The Heat (send police after opponents), Jammer (invisibility to police), Tank (resistance to crash damage), Soundwave (circular explosion), and Repair (immediate car restoration). Repair is the most important, as players' car must be in good repair to accumulate Nitro and be immune from being busted by the cops. A complex yet extensive range of visual customization options is available, including body kits, wheels, and a full range of colors & vinyls, including freehand drawing ability. The most obvious difference is that the graphics and racing physics in this version are completely different from the other versions, giving it a retro look and feel reminiscent of much older pre-GameCube or Mario Kart type games. The game was first hinted at during E3 2009 by EA’s CEO, John Riccitiello. Riccitiello stated that Criterion Games, developers of EA's own Burnout series, was working on a "revolutionary" addition to the Need for Speed franchise, stating: "We don't have a plan right now for a separate major launch on Burnout, because the team doing it is working on a revolutionary take on Need for Speed." The title was confirmed to be in development by EA's chief operating officer, John Pleasants, at a Stock meeting in June 2009, where he stated: "We've taken the Burnout team and combined it with our Need for Speed franchise. So we now have that in our favor because that Burnout team is probably one of the more online-centric and notably high-quality game developers that we have out at Criterion." Shift producer, Jesse Abney, expressed his delight to work with Criterion Games, stating that it would be a "great team to work with on that stuff," referencing the development of Need for Speed. It was reported that the game was scheduled for release in Q4 2010. EA's COO, John Schappert, said that the Q4 NFS title was, "a new action based Need for Speed from our Criterion Studio," in a post-financial report conference call. The title was officially revealed as Need for Speed: Hot Pursuit at EA's Media Briefing during E3 2010, with a trailer which showed a high-speed police chase involving three different racers. The trailer was followed by a live demo of the game on stage between creative director Craig Sullivan as a cop and producer Matt Webster as a racer. According to Riccitiello, the game was in development for two years. In August 2010, before Need for Speed: Hot Pursuit was set to take center stage at EA's press conference during Gamescom, it was announced by art director Henry LaBounta that Criterion collaborated with Battlefield creators EA Digital Illusions CE (DICE) in building the massive open world of Need for Speed: Hot Pursuit. Early in November 2010, Patrick Söderlund, Senior Vice President of EA Games Europe, said this of the collaboration: "I think the most important thing, when you have two high-quality developers working together, for it to work, they need to have mutual respect. They need to have that respect, to say ‘Ok, we trust you to do this.’ This was a case where that was so obvious, where the Criterion team had a full trust in the DICE team to do what they were doing, and vice versa." Recent games in the Need for Speed franchise included a story, but Matt Webster, producer of Hot Pursuit, said: "We didn’t really think it was necessary to include a story. If you’re a cop, the aim is to go up the ranks, while a racer’s aim is to get to the highest rank they can." EA stated that the combination of acclaimed developer Criterion Games, a socially-focused online mode and official car licences makes the franchise more accessible than before. UK product manager for Need for Speed Kevin Flynn said: "This is definitely the best Need for Speed I’ve seen to date. I thought Shift was a great game but different and a bit serious, while Hot Pursuit is more fun and accessible." With the game sharing the same title as the 1998 installment in the franchise, the game’s creative director, Craig Sullivan, told why they didn’t name the game something totally different, stating: "To be honest when we started out making the game we didn’t know it was going to be called Need for Speed: Hot Pursuit, we just didn’t. We got to the game before we got to the name. We realized we were making something that had a lot of cops in it and was really interesting to us, so we thought what can we call this? Eventually we thought this actually fits quite well with Hot Pursuit and went with it." "Criterion’s a AAA developer of action-racing games, with many years of doing great designs, great innovations, and platform technologies – especially for PlayStation 3 and online connectivity. And they kind of just waited patiently for their turn to get the keys to develop their favorite Need for Speed – and revive Hot Pursuit. Hot Pursuit really is a milestone in the Need for Speed ethos of 'grab an exotic car, pick an exotic location, and hit the pavement'. And that really is a core tenet of Criterion’s expertise. It was really their interest and their call to revive Hot Pursuit." The game features 7.1 channel surround sound in PCM (Dolby Digital and DTS are also available). The soundtrack of Hot Pursuit features a general track list as is seen in EA Black Box Need for Speed games such as Most Wanted, Carbon and Undercover rather than a scored soundtrack as seen in ProStreet and Shift. The song "Edge of the Earth" by Thirty Seconds to Mars serves as the game's theme song. Players can also add custom soundtracks to the game, so that any music stored on the player’s hard drive can be selected during gameplay, as long as they are added to a playlist via the console's system menu. As well as optionally using songs from the player's hard drive, several categories of licensed music are available for the game's racing, menu screens, and the photo mode. EA announced the One Million Challenge on 25 November 2010. If the Need for Speed: Hot Pursuit launch trailer received one million views on YouTube by 12 December 2010, a free downloadable content (DLC) pack would be released with three new cars. Although the trailer fell short of the million views, EA still awarded the three cars for free. EA stated the cars will be added to the game through a future title update on the PlayStation 3 and Xbox 360; PC were told that EA will share more news when it becomes available. On 14 December 2010 the first update was released which added the three cars to the player's garage. Xbox 360 players experienced problems with the update. Criterion released another Xbox 360 title update the following day, however, some users reported that the new update had caused their career saves and racing stats to be reset. On 17 December 2010 a third title update was released which repaired these issues. Criterion released the official second update for the consoles on 15 February 2011, addressing some minor issues and glitches. Criterion also promised updates to add new features in addition to bug fixes for the PC version. The first update for the PC was released on 26 November 2010 which addressed crashes, issues with aspect ratios, and missing effects. D-Box motion chair support was also added. The second update for the PC was released on 19 January 2011, which fixed issues with flickering graphics, controller configurations, steering response, player car engine audio volume, CPU performance and rare crash issue when entering the Career map screen. The three free cars from the One Million Challenge was also added. The third update for the PC was released on 17 March 2011, which fixed several issues players were having relating to game crashes and bugs. The fourth update for PC was released on 4 April 2011, which stamped out another 30 percent of the game's known bugs, with a total of 77 percent of the issues fixed. The fifth update for PC was released on 14 April 2011, as with the most recent patch this new update is mainly to deal with various game crash issues which players have encountered while playing the game. One game crash in particular, which occurred on some systems when players were prompted to "Press Any Key", has been fixed in this patch. EA announced that PC version of the game would not receive downloadable content. Criterion confirmed this on their official message boards; "We have a limited amount of resources that makes it so that we are unable to deliver new content to all platforms, however we do have more updates and content on the way for PC players." In addition to the free update, Criterion has released several optional, premium packs that add content like new cars and events. The first two DLC packs for Hot Pursuit were released one week after the game's launch. Dubbed Racer Timesaver Pack and SCPD Timesaver Pack, either pack grants the player immediate access to every car in the game on the relevant side of the law. Buying the Racer Timesaver Pack, for example, gives the player access to all the Racer cars, and vice versa for the SCPD. The third pack for Hot Pursuit was released one week after the first two one. The SCPD Rebels Pack, adds seven new cars previously available only in police variants to the Racer line-up, including the Audi R8 5.2 FSI and Aston Martin DBS. EA announced the first official DLC for Hot Pursuit on 6 December 2010. The Super Sports Pack adds three new cars; the Porsche 911 GT2 RS, GUMPERT Apollo S, and Bugatti Veyron 16.4 Super Sport in variants for both sides of the law. There are also 13 new race and pursuit events, and new trophies/achievements to earn. It was released on 21 December on the Xbox 360 and PlayStation 3 in North America and on 22 December on PlayStation Network in Europe. Although this is the first official DLC, extra additional content can also be purchased via online storefronts. Criterion’s announced three new DLC packs for Hot Pursuit on 17 February 2011. Armed and Dangerous brings two new online game modes. ‘Most Wanted’ has the cops in pursuit of a single racer in an open world, with the other racers fighting to protect him. ‘Arms Race’ is free-for-all racing that sees weapons enabled. In addition, this pack also contains three new trophies/achievements. It was available from 22 February on the PlayStation Network and Xbox LIVE Marketplace. The second and third packs, Lamborghini Untamed and Porsche Unleashed, adds the Lamborghini Diablo SV, Lamborghini Countach LP5000 QV and Lamborghini Sesto Elemento, while the Porsche pack (named after the series' fifth installment) adds the Porsche 911 Turbo (1982 Edition), Porsche 959 and 911 Speedster as both cops and racers. Both packs bring 10 new events and four new trophies/achievements. The Lamborghini Untamed pack was available from 1 March and Porsche Unleashed pack from 8 March on the PlayStation Network and Xbox LIVE Marketplace. In addition, the Three for All Bundle was released on 22 March only on the PlayStation Store, which is just a big bundle that consists of the Porsche Unleashed, Lamborghini Untamed, and the Armed and Dangerous packs. A limited edition of the PC game was released to EA employees during December 2010. The EA Crew Edition includes seven bonus racer cars; Mercedes-Benz SLR McLaren 722 Edition, Maserati Quattroporte Sport GT S, Chevrolet Corvette Z06, Lamborghini Reventon, Bugatti Veyron 16.4, Aston Martin DBS, and Audi R8 5.2 FSI (these vehicles were later released in the SCPD Rebels Pack). The box is not labeled for retail sale and the disc is marked as "not for resale". In early July 2010 EA announced Need for Speed Hot Pursuit on Tour, a seven-city event that took the game around the United States prior to the game's release. Each stop featured recording artists and showcased an assortment of exotic cars. The tour began on 14 July 2010 at the Manhattan Classic Car Club in New York City, headlined by DJ Z-Trip. It then continued to Chicago, Seattle, San Francisco, Austin and Miami, ending with the Hot Pursuit launch party in Los Angeles. EA received a helping hand from UK vehicle wrapping company Totally Dynamic for the UK launch event, held at Totally Dynamic’s South London centre. In addition to the standard edition, a Limited Edition of the game has been released, which was originally only available through pre-order at the same price as the regular game. However, it was still available beside the regular game, but in limited quantities. The Limited Edition features numerous bonuses over the standard edition, including exclusive packaging, two exclusive racers and four unlocked cars. The Need for Speed: Hot Pursuit demo was available for download on 26 October on Xbox Live Marketplace worldwide and the PlayStation Network in North America and on 27 October 2010 on the PlayStation Network in Europe. The demo was a limited time demo and closed on 9 November 2010. Criterion Games stated that "Unlike Xbox 360 and PS3 versions, PC demos require comparatively more resources to ensure that they run smoothly across a wide variety of systems," for not getting the chance to release a demo for the PC. The demo was a hit, the demo was download more than 2 million times, making the demo for Hot Pursuit the "most popular demo in Need for Speed history". EA announced on 15 November 2010 the first two Games with Developer, both on the first weekend after the game launched. The event allowed the players to test their newly developed skills against those who had a hand in creating the game. EA announced on 26 November 2010 an Autolog Recommends Contest. It was a two-week-long competition. If the fans beat any of NFSDrew’s Need for Speed: Hot Pursuit Autolog recommended times on Xbox or PS3, had one of them the chance to win a custom (NTSC) Need for Speed: Hot Pursuit PlayStation 3, which is an extremely rare Collector's Edition. EA has also announced two Autolog Photo Contest, the first ended 26 November 2010 and the second 6 January 2011. The players had to take creative photos, then EA with the community announced the best and creative photo, which win a custom Need for Speed: Hot Pursuit PlayStation 3 Limited Collector's Edition. EA announced the Friday Gaming Sessions, which started 17 January 2011 and will be on every Friday from 3pm to 5pm PST. EA announced the Need for Speed Autolog iPhone app in late November 2010. The app features the Wall, Dreamshots, Autolog Recommendations, SpeedWall and a Play Later button. The app was released on iTunes on 13 December 2010. In addition to the trailer shown at the official reveal during E3 2010, several other game trailers have been released, each revealing new aspects of the game. One trailer promoted the Limited Edition of the game, which features additional cars. Some trailers explained the game's new Autolog feature. Two trailers released in September 2010 showcased the different aspects of cops vs racer gameplay. A trailer released on 25 September 2010 promoted the limited-time demo. Three video clips were released on 29 October 2010. Entitled "Fast Needs no Friends", these videos depict two foolish valet parkers, Kevin Dillon and Jerry Ferrara, who have gained a love for fast, exotic cars, by playing Need for Speed: Hot Pursuit. Several trailers were released in November. A trailer was released for indicate Seacrest County, the game’s primary locale. A trailer was released for hint that the demo was a success. Two live action trailers was also released to showcase the relationship between the cops and racers. A launch trailer was also released on 16 November 2010. A new video clip was released 15 December 2010, which featured the two foolish valet parkers Kevin Dillon and Jerry Ferrara again. Most of the trailers are now available for free download on Xbox LIVE Marketplace and PlayStation Network. Four developer diaries were released to promote the game. The first was released on 14 October 2010 which features the game’s Producer detailing the Autolog feature. On 28 October 2010 the second developer diary was released that features the game's Creative Director explaining the contents of the recently released demo. The third developer diary, released on 6 November 2010, details the specifics Seacrest County's terrain and climate, as well as explaining day and night cycles. It was also released two video early in November that featured the game’s Designer, he gave some tips on how to succeed in the Dark Horse and Roadsters Reborn events in the demo. If some of the fans beat his record on the Roadsters Reborn event, they had a chance to win some NFSHP prizes. The fourth diary, released 26 November 2010, explains why and how the game's cars were chosen. Need for Speed: Hot Pursuit was well received by critics at E3 2010 and was most notably awarded with "Best Racing Game" from Game Critics Awards as well as several other media outlets. Other games in the category included Forza Motorsport 4, Gran Turismo 5, Test Drive Unlimited 2 and MotorStorm: Apocalypse. IGN stated that it had "an inspired level of connectivity", while 1UP.com claimed that "the other racing games at E3 never had a chance". This was the first game in the Need for Speed series since the original Hot Pursuit to win an E3 award. Hot Pursuit was also nominated for "Best Xbox 360" and "Best PS3" game by IGN, and "Best Graphics" by Gaming Excellence. Hot Pursuit was received positively upon release, review-aggregating website Metacritic hold the average score for the PlayStation 3 version at 89/100, the Xbox 360 version at 88/100, and the PC version at 86/100, while the Wii version was met with mixed or average reviews receiving 50/100. In the edition of 8 November 2010 of Official U.S. PlayStation Magazine, the first review score was given as 10/10. The reviewer said "It's consistently challenging without feeling difficult. It's immensely rewarding without ever being taxing." IGN gave the game 9.0 out of 10 and an Editor's Choice Award, praising the game's "pure over-the-top driving entertainment. The cars and environments are gorgeous, the crashes are spectacular, and the new Autolog feature breathes new life into the time-honored tradition of video game competition among friends." Eurogamer gave the game 9 out of 10. Reviewer Tom Bramwell said "It's stuffed with content but rarely for the sake of it, and knowing Criterion it will be handsomely supported for months to come, even though it's already the best pure arcade racing game since Burnout Paradise." GameTrailers also scored the game 9 out of 10. The reviewer stated Hot Pursuit was "excellently crafted, letting you take the world's fastest cars across miles of stunning landscapes. Chases are exhilarating from either perspective, and the autolog feature completely changes how you compete with friends, keeping you hooked until you've wrecked all of their scores." Destructoid gave the game 9.5 out of 10. Reviewer Nick Chester noted that "it delivers a near-perfect competitive experience, in a way that few games - racing or otherwise - can. Hot Pursuit is not only a defining moment for the series, but for arcade-style racing, period." Reviewer Randy Nelson of Joystiq was the second reviewer to give the game a perfect score of 10/10. Reviewer Chris Antista of GamesRadar also gave the game 10 out of 10. Chris stated that "with so many modes and diverse rewards to uncover in Need For Speed: Hot Pursuit, it almost feels like 2.5 games in one package." Electronic Gaming Monthly reviewer Brett Bates gave the game 9.0 out of 10, which felt much the same as GamesRadar's Chris Antista, stating "In effect, you're getting two games in one: What you do as a racer has no bearing on what you do as a cop." Reviewer Tom Orry of VideoGamer gave the game 8 out of 10, and stated "the core driving is never anything but exhilarating, visually it's almost flawless and the Autolog features are genre leading. There's still something missing, though - a reason to explore the open world." GameSpot awarded the game 8.5 out of ten and said "This fast-paced racer keeps you glued to the TV and on the edge of your seat regardless of which side of the law you're playing on." Official Xbox Magazine gave the Xbox 360 version 7 out of 10, and said "Hot Pursuit feels a little too safe for its subject matter, limited by pedestrian road design that doesn't express all the playfulness that we'd expect in car combat." However, the UK edition of the magazine gave the game a 9 out of 10, and said "It pays respect to the classic NFS games, borrows the best bits from Burnout and is a technical masterpiece. The chase to reclaim NFS's once legendary chart topping form is well and truly on." PlayStation Lifestyle reviewer Thomas Williams gave the game 9 out of 10, and stated "What Criterion Games has done with Need for Speed: Hot Pursuit is develop the best entry in the series in the last 5 years of release. Once you start playing this game, there is no way you can play just one race." PlayStation Lifestyle writer Mike Hartnett declared Hot Pursuit better than Gran Turismo 5, and concluded with "Need for Speed: Hot Pursuit is just downright more fun than anything rolling out of Polyphony Digital’s garage. There is certainly no shortage of epic moments in this game. Whether you're tearing through single-player mode to rank-up as a cop or a racer, throwing down spike strips to take out your friends online, or just relieving a bit of stress by driving around in free-ride mode." "Need for Speed: Hot Pursuit was an immensely successful game. Games in any genre need to offer great gameplay and above all, constantly innovate. By taking those ingredients our racing games have a bright future." In the UK, Need for Speed: Hot Pursuit debuted at number three on the UK All Format Gaming Chart on its first week of release, beaten by Activision’s Call of Duty: Black Ops and Ubisoft’s Assassin's Creed: Brotherhood. The second week was it dropped down to number six. However, the fourth week, Hot Pursuit sales jumped 48 percent, which boosted the game from seventh to third. The sixth week, Hot Pursuit sales were down 67 percent, which slipped down one place to number fourth. The seventh week, Hot Pursuit was placed number ten, but the next week it jumped up to number seven. 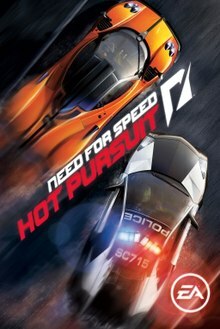 In the US, Hot Pursuit was ranked number seven on NPD's sales charts for November 2010, outselling Sony's racing juggernaut Gran Turismo 5, which launched about a week later. On 10 December 2010 GamesIndustry reported that Hot Pursuit managed to sell 417,000 units in the US in just two weeks. Cowan and Company reported that despite the positive sales figures were not enough to pick up EA's year on year sales figures. The analytical firm stated that the year on year sales figures for November were still down 25 percent for EA. Gamertell stated that "Hot Pursuit's success is a big boost for a genre that has taken some hits in 2010, as well as a franchise that has been searching for its identity. After several 'reinventions', EA turned to Criterion Games, the studio famous for the Burnout series, to right this racer. Criterion took the series back to the high-octane formula of cops chasing racers. Unlike actual illegal street racers, Hot Pursuit fans seem happy to see the police." Hot Pursuit was placed number ten on NPD's sales charts for December 2010 with sales of 906,000 units for the month. On 1 February 2011, on EA's financial result report of Q3 2010 was it mentioned that the game has sold more than 5 million units. "It's on a sharp uptick the last couple of years as we've driven high-quality titles ever higher in the charts, particularly in Europe but also in North America," John Riccitiello, EA CEO, said during the publisher's overnight Q3 earnings call. Wedbush Morgan analyst Michael Pachter commented on the figures, saying that they were slightly over his expectation of 4.5 million units at this point. Hot Pursuit surprised him, then, but not as much as Medal of Honor did. Early in November, analyst Mike Hickey also said he believed EA's Hot Pursuit could sell 4.2 million copies during the 2010 Christmas period. Following the high praise it received at its release, Need for Speed: Hot Pursuit received numerous awards from various magazines, trade shows and gaming websites. The game has won over 30 different awards, including Racing Game of the Year from major publications, more than any other racing game that year. In 2010, at the E3 2010, Game Critics Awards gave Hot Pursuit the Best Racing Game award. Hot Pursuit was named the Best Driving Game at the 2010 Spike Video Game Awards. Hot Pursuit was awarded Best Racing Game by GameSpot, 1UP, GameSpy, and Shacknews. VGChartz awarded Hot Pursuit the Best Racing Game on Xbox 360, while GameTrailers and Game Revolution nominated Hot Pursuit for Best Racing Game. Hot Pursuit was awarded Best Competitive Multiplayer on Xbox 360 by IGN, as well as a nomination for Most Addictive Game on Xbox 360, while GamesRadar nominated it for Multiplayer That Broke The Mold. Giant Bomb gave Hot Pursuit the Most Improved Franchise award, while Gamereactor awarded Hot Pursuit for the Year's Fastest. In 2011, at the 2011 Academy of Interactive Arts & Sciences, Hot Pursuit was named Racing Game of the Year, and at the 2011 BAFTA Video Games Awards, Hot Pursuit won the Multiplayer award. At the 2011 Golden Joystick Award, Hot Pursuit was a runner up for Racing Game of the Year. Hot Pursuit was nominated for Favorite Videogame at the 2011 Nickelodeon Kids' Choice Awards, and Best Game at the 2011 BAFTA Kid's Vote Award. ^ Jonathan Wahlgren (15 June 2010). "Wii Version". Nintendolife. Retrieved 15 June 2010. ^ "Marios Takoushis". Dynamod Web Portals/Fluxure Advanced Motion Media, Inc. Retrieved 29 November 2013. ^ "Vanesa Lorena Tate". Vanesa Lorena Tate. Retrieved 29 November 2013. ^ "Need For Speed: Hot Pursuit (PS3) – Release dates". GameSpot. Archived from the original on 31 August 2010. Retrieved 24 October 2010. ^ a b Hinkle, David (14 June 2010). "Need for Speed: Hot Pursuit races to retail November 16". Joystiq. Retrieved 16 November 2010. ^ a b c Guy Cocker (15 June 2010). "E3 2010: Need for Speed: Hot Pursuit Hands-On". GameSpot UK. Archived from the original on 18 June 2010. Retrieved 15 June 2010. ^ "Preview: Need for Speed: Hot Pursuit". Gamer.no. 23 October 2010. Retrieved 31 October 2010. ^ "Over 100 miles of open road". Criterion Games (via Twitter). 17 June 2010. Retrieved 24 June 2010. ^ "Opinion: Did Hot Pursuit's Autolog Just Save the Racing Genre?". Gamasutra. Retrieved 4 September 2017. ^ a b c d "E3 2010 Stage Demo: Need for Speed Hot Pursuit and the gameplays the same as "Need For Speed:rivals". GameSpot. 16 June 2010. Archived from the original on 19 June 2010. Retrieved 24 June 2010. ^ "Autolog Dashboard - Answer HQ". Answers.ea.com. 19 July 2012. Retrieved 23 November 2013. ^ NFSKirk (22 June 2010). "NFSRon Talks to HP Creative Director". Electronic Arts. Archived from the original on 24 June 2010. Retrieved 24 June 2010. ^ "Porsche 918 Spyder". Criterion Games (via Twitter). 17 June 2010. Retrieved 24 June 2010. ^ "Ferrari". Criterion Games (via Twitter). 29 June 2010. Retrieved 12 July 2010. ^ a b "Need for Speed: Hot Pursuit". Metacritic. Retrieved 30 May 2018. ^ a b Life, Nintendo (21 November 2010). "Review: Need For Speed: Hot Pursuit (Wii)". Nintendo Life. Retrieved 30 May 2018. ^ Life, Nintendo (15 June 2010). "E3 2010: Need For Speed in Hot Pursuit of Wii". Nintendo Life. Retrieved 30 May 2018. ^ "Need For Speed Hot Pursuit Review", computerandvideogames.com, 13 December 2010, accessed 24 April 2010. ^ Stephen Totilo (10 June 2009). "EA: Burnot Devs Making "Revolutionary" Need for Speed". Kotaku. Retrieved 16 June 2009. ^ "Criterion Games also developing next Need for Speed". IGN UK. 10 June 2009. Retrieved 24 April 2011. ^ "Criterion "would be a great team to work with" on Need for Speed". VG247. 28 April 2009. Retrieved 24 April 2011. ^ Alex Petraglia (14 May 2009). "Criterion Developing Need for Sped Title for Release in 2010". Primotech. Archived from the original on 29 November 2009. Retrieved 26 October 2009. ^ "EA Reveals New Need For Speed Titles [UPDATE] News". TVG. 9 February 2010. Archived from the original on 26 August 2011. Retrieved 24 April 2011. ^ "Need for Speed E3 Reveal". GameTrailers. 14 June 2010. Retrieved 15 June 2010. ^ "EA: We ruined Need For Speed with studio 'death march'". Computerandvideogames.com. 20 September 2010. Retrieved 31 October 2010. ^ "How DICE collaborated on Need for Speed's game world". Eurogamer.net. 14 August 2010. Retrieved 8 November 2010. ^ "'Need for Speed Hot Pursuit' Interview with Patrick Söderlund". Gamerant.com. 2 November 2010. Retrieved 8 November 2010. ^ Justin (28 September 2010). "Need for Speed Hot Pursuit full of speed and cars, not so much on plot". mmomfg.com. Archived from the original on 14 November 2010. Retrieved 13 October 2010. ^ "Hot Pursuit 'is best NFS yet'". Mcvuk.com. 4 October 2010. Archived from the original on 7 October 2010. Retrieved 31 October 2010. ^ Tanvir, Asim (4 October 2010). "Need for Speed: Hot Pursuit Developer Interview". Godisageek.com. Retrieved 2 December 2010. ^ Rubenstein, Jeff (29 September 2010). "Need for Speed: Hot Pursuit – Social Modes and EA Answers Your Questions". blog.us.playstation.com. Retrieved 22 December 2010. ^ "Need For Speed: Soundtrack". Needforspeed.com. Retrieved 11 December 2010. ^ "Custom Soundtracks". Criterion Games (via Twitter). 27 June 2010. Retrieved 8 July 2010. ^ "Need for Speed: Hot Pursuit". GiantBom.com. Retrieved 17 January 2010. ^ "The Need for Speed Hot Pursuit One Million Challenge!". Needforspeed.com. 25 November 2010. Archived from the original on 29 November 2010. Retrieved 2 December 2010. ^ "1 Million Challenge Car Showcase". Needforspeed.com. 6 December 2010. Archived from the original on 10 December 2010. Retrieved 11 December 2010. ^ "One Million Challenge Results". Needforspeed.com. 13 December 2010. Archived from the original on 13 December 2010. Retrieved 13 December 2010. ^ "Official Need for Speed (Update)". Facebook.com. 15 December 2010. Archived from the original on 8 September 2012. Retrieved 19 December 2010. ^ "Official Need for Speed (Update)". Facebook.com. 17 December 2010. Archived from the original on 2 December 2012. Retrieved 19 December 2010. ^ "Official Need for Speed (Update)". Facebook.com. 17 December 2010. Retrieved 19 December 2010. ^ "Hot Pursuit Title Update 1.2 Arrives". Needforspeed.com. 14 February 2011. Retrieved 17 February 2011. ^ "Need for Speed Hot Pursuit PC Patch 1". Needforspeed.com. 26 November 2010. Archived from the original on 30 November 2010. Retrieved 2 December 2010. ^ "Need for Speed Hot Pursuit PC Patch 2". Needforspeed.com. 2 December 2010. Archived from the original on 11 December 2010. Retrieved 11 December 2010. ^ "Hot Pursuit PC Patch 2 Released". Needforspeed.com. 19 January 2011. Archived from the original on 23 January 2011. Retrieved 28 January 2011. ^ "Hot Pursuit PC Update 1.03". Needforspeed.com. 17 March 2011. Retrieved 19 February 2011. ^ "Need for Speed: Hot Pursuit PC patch released". CVG. 11 April 2011. Retrieved 12 April 2011. ^ "Download: Need For Speed Hot Pursuit 1.05 PC Patch". Big Download. 14 April 2011. Retrieved 28 April 2011. ^ "EA: No DLC for PC version of Need for Speed: Hot Pursuit". Gamepur.com. 13 December 2010. Retrieved 25 December 2010. ^ "EA NFS: Hot Pursuit PC won't get DLC". ComputerandVideoGames.com. 12 December 2010. Retrieved 25 December 2010. ^ "Need For Speed: Hot Pursuit (PC) DLC, Criterion Says No To". mibz.com. 17 December 2010. Archived from the original on 27 December 2010. Retrieved 25 December 2010. ^ "First Need For Speed: Hot Pursuit DLC available now". GamerZines.com. 22 November 2010. Archived from the original on 3 December 2010. Retrieved 2 December 2010. ^ "More Need For Speed: Hot Pursuit DLC available now". GamerZines.com. 24 November 2010. Archived from the original on 4 December 2010. Retrieved 2 December 2010. ^ "EA announces new premium DLC for NFS: Hot Pursuit". GamerZines.com. 6 December 2010. Archived from the original on 10 December 2010. Retrieved 11 December 2010. ^ "NFS Hot Pursuit Super Sports Pack Arrives December 21st". Needforspeed.com. 10 December 2010. Archived from the original on 12 December 2010. Retrieved 11 December 2010. ^ "NFS 'NFS: Hot Pursuit' DLC announced". Digitalspy.co.uk. 11 December 2010. Retrieved 11 December 2010. ^ a b "Need for Speed: Hot Pursuit Getting Three More DLC Packs". RipTen. 17 February 2011. Retrieved 18 February 2010. ^ a b "Need for Speed Hot Pursuit gets 3 new DLC packs". Computer and VideoGames. 17 February 2011. Retrieved 18 February 2010. ^ a b "Criterion announces Hot Pursuit DLC triple-whammy". VG247. 17 February 2011. Retrieved 18 February 2010. ^ "Hot Pursuit Three for All Bundle is Live on PlayStation 3". NeedforSpeed. 22 March 2011. Retrieved 28 April 2011. ^ "Need for Speed: Hot Pursuit EA Crew Edition". wecollectgames.com. 26 December 2010. Retrieved 9 February 2011. ^ "A Glimpse at EA's Employee-Only Version of Need for Speed: Hot Pursuit". kotaku.com. 15 December 2010. Retrieved 9 February 2011. ^ "Need for Speed Hot Pursuit On Tour - NYC Video". needforspeed.com. 29 July 2010. Retrieved 7 October 2010. ^ "Need for Speed Hot Pursuit On Tour - Chicago Video". needforspeed.com. Archived from the original on 10 October 2010. Retrieved 7 October 2010. ^ "PAX Recap Post". needforspeed.com. 7 September 2010. Archived from the original on 11 September 2010. Retrieved 2 December 2010. ^ "NFSHP On Tour - Musical Talent". needforspeed.com. 15 September 2010. Archived from the original on 1 October 2010. Retrieved 2 December 2010. ^ "Revisiting NFSHP On Tour Austin!". needforspeed.com. 27 October 2010. Archived from the original on 29 October 2010. Retrieved 2 December 2010. ^ "Need for Speed Hot Pursuit On Tour Miami Video". needforspeed.com. 11 November 2010. Archived from the original on 20 November 2010. Retrieved 2 December 2010. ^ "On Tour: Los Angeles Launch Vignette". GameTrailers.com. 23 November 2010. Retrieved 2 December 2010. ^ "It's a wrap for the UK launch of EA's Need for Speed – Hot Pursuit". Skiddmark.com. Retrieved 31 October 2010. ^ Need for Speed: Hot Pursuit Limited Edition (PS3). "Need for Speed: Hot Pursuit Limited Edition (PS3)". Game.co.uk. Retrieved 7 October 2010. ^ Need for Speed Hot Pursuit DEMO Announced! (25 October 2010). "Need for Speed Hot Pursuit DEMO Announced!". NeedforSpeed.com. Retrieved 31 October 2010. ^ The Need for Speed Hot Pursuit demo is out today! (26 October 2010). "The Need for Speed Hot Pursuit demo is out today!". NeedforSpeed.com. Retrieved 31 October 2010. ^ Hot Pursuit Demo (27 October 2010). "Hot Pursuit Demo". NeedforSpeed.com. Archived from the original on 1 November 2010. Retrieved 31 October 2010. ^ EA.com (25 October 2010). "Feel the Rush of Besting Your Friends with Criterion's Groundbreaking 'Autolog' Social Network". EA.com. Retrieved 31 October 2010. ^ "Why there's no PC demo for NFS: Hot Pursuit". TGN Times. Retrieved 31 October 2010. ^ a b "Need for Speed Hot Pursuit Demo - Time Is Running Out". NeedforSpeed.com. 6 November 2010. Archived from the original on 10 November 2010. Retrieved 8 November 2010. ^ "Game With Dev - Saturday and Sunday!". Needforspeed.com. 15 November 2010. Archived from the original on 30 November 2010. Retrieved 13 December 2010. ^ "Need for Speed Hot Pursuit - Autolog Recommends Contest". Needforspeed.com. 26 November 2010. Archived from the original on 30 November 2010. Retrieved 2 December 2010. ^ "Beat NFSDrew for the Chance to Win a PlayStation3". Needforspeed.com. 8 December 2010. Archived from the original on 11 December 2010. Retrieved 11 December 2010. ^ "Need for Speed Hot Pursuit Autolog Photo Contest". Needforspeed.com. 17 December 2010. Archived from the original on 13 December 2010. Retrieved 19 December 2010. ^ "Friday Gaming Sessions Return, Hot Pursuit Style!!". Needforspeed.com. 7 January 2010. Archived from the original on 10 January 2011. Retrieved 5 January 2010. ^ "Need for Speed Autolog iPhone App". Needforspeed.com. 26 November 2010. Archived from the original on 30 November 2010. Retrieved 2 December 2010. ^ "Need for Speed Autolog iPhone App". Needforspeed.com. 13 December 2010. Archived from the original on 30 November 2010. Retrieved 13 December 2010. ^ "Pre-Order | Need for Speed Hot Pursuit". needforspeed.com. 16 August 2010. Archived from the original on 10 November 2010. Retrieved 31 October 2010. ^ "Need For Speed: Hot Pursuit Video Game, GC 10: Warning Trailer | Video Clip | Game Trailers & Videos". GameTrailers.com. 17 August 2010. Retrieved 31 October 2010. ^ "Need For Speed: Hot Pursuit Video Game, Autolog Recommends: Sun, Sand & Supercars | Video Clip | Game Trailers & Videos". GameTrailers.com. 3 September 2010. Retrieved 31 October 2010. ^ "Hot Pursuit Autolog Recommends - Arms Race". Need for Speed. Retrieved 31 October 2010. ^ "Feel the Need For Speed Inside a Hot Pursuit Interceptor". PlayStation LifeStyle. 23 October 2010. Retrieved 31 October 2010. ^ Need for Speed Hot Pursuit - Wanted (24 September 2010). "Need for Speed Hot Pursuit - Wanted". NeedforSpeed.com. Retrieved 13 October 2010. ^ 29 October 2010 by Jake Green at 7:38 pm. "Need for Speed: Hot Pursuit gets three new trailers". Made 2 Game. Retrieved 31 October 2010. ^ "Need for Speed: Hot Pursuit's Seacrest County is Dandy". PlaystationLifeStyle.net. 4 November 2010. Retrieved 8 November 2010. ^ "[VIDEO] Need for Speed: Hot Pursuit trailer takes in Seacrest County". The Inquisitr. 4 November 2010. Retrieved 8 November 2010. ^ "Power Struggle Live Action Trailer". Gametrailers.com. 9 November 2010. Retrieved 10 November 2010. ^ "Pagani vs Lamborghini Trailer". Gametrailers.com. 19 November 2010. Retrieved 5 December 2010. ^ "Need for Speed Hot Pursuit is AVAILABLE NOW!". NeedforSpeed.com. 16 November 2010. Archived from the original on 5 December 2010. Retrieved 8 December 2010. ^ "Valets #4 -- Holiday Speed". NeedforSpeed.com. 17 November 2010. Archived from the original on 19 December 2010. Retrieved 19 December 2010. ^ "Criterion Explains Need for Speed Hot Pursuit's Autolog Feature". Game Rant. 14 October 2010. Retrieved 31 October 2010. ^ "Need for Speed Hot Pursuit Trailer Explains Demo". AusGamers.com. Retrieved 31 October 2010. ^ "Welcome to Seacrest County". NeedforSpeed.com. 6 November 2010. Archived from the original on 10 November 2010. Retrieved 8 November 2010. ^ "Need For Speed Hot Pursuit Demo - Roadster Reborn 101". NeedforSpeed.com. 7 November 2010. Archived from the original on 10 November 2010. Retrieved 8 November 2010. ^ "COMPETITION! Exclusive Need For Speed: Hot Pursuit prizes to be won!". GamerZines.com. 26 October 2010. Archived from the original on 10 November 2010. Retrieved 2 December 2010. ^ "The Cars of Need for Speed Hot Pursuit". Needforspeed.com. 26 November 2010. Archived from the original on 30 November 2010. Retrieved 2 December 2010. ^ "Game Critics Awards 2010 winners". Game Critics Awards. Retrieved 12 July 2010. ^ a b IGN staff (17 June 2010). "E3 2010: Best of E3 Awards". IGN. Retrieved 24 June 2010. ^ 1UP staff (19 June 2010). "1UP's Best Games of E3 2010 – Best Game by genre". 1UP.com. Archived from the original on 30 July 2012. Retrieved 24 June 2010. ^ GamePro Staff. "E3 2010: The Best of E3, Feature Story from". GamePro. Archived from the original on 7 December 2010. Retrieved 26 October 2010. ^ 24 June 2010 - By Andrew Pfister (24 June 2010). "X-Play & G4tv.com's Best Of E3 2010 Awards". G4tv.com. Retrieved 26 October 2010. ^ a b "GamingExcellence's Best of E3 2010 at GamingExcellence". Gamingexcellence.com. 25 June 2010. Retrieved 26 October 2010. ^ a b c "Get the Edge on Day 1 with the Limited Edition". needforspeed.com. Archived from the original on 10 October 2010. Retrieved 7 October 2010. ^ a b "Need for Speed: Hot Pursuit for PlayStation 3 Reviews". Metacritic. CBS Interactive. Retrieved 13 March 2012. ^ a b "Need for Speed: Hot Pursuit for Xbox 360 Reviews". Metacritic. CBS Interactive. Retrieved 13 March 2012. ^ a b "Need for Speed: Hot Pursuit for PC Reviews". Metacritic. CBS Interactive. Retrieved 13 March 2012. ^ a b "Need for Speed: Hot Pursuit for Wii Reviews". Metacritic. CBS Interactive. Retrieved 13 March 2012. ^ "Need for Speed: Hot Pursuit Review". GameInformer.com. 15 November 2010. Retrieved 2 December 2010. ^ "Review: Need for Speed: Hot Pursuit Review". ComputerandVideogames.com. 9 November 2010. Retrieved 10 November 2010. ^ a b "Review: Need for Speed: Hot Pursuit". Destructoid. 9 November 2010. Retrieved 10 November 2010. ^ a b "Need for Speed: Hot Pursuit – A Match Made in Heaven". EGM. 16 November 2010. Archived from the original on 24 November 2010. Retrieved 25 April 2011. ^ a b "Need for Speed: Hot Pursuit Review". Eurogamer. 9 November 2010. Retrieved 10 November 2010. ^ Gaskill, Jake (9 November 2010). "Need for Speed Hot Pursuit Review". G4tv. Retrieved 22 May 2011. ^ "Criterion races into pole position with Hot Pursuit - Need for Speed: Hot Pursuit - Xbox 360". GameInformer.com. 9 November 2010. Retrieved 16 November 2010. ^ Hayward, Andrew (22 November 2010). "Need for Speed: Hot Pursuit". GamePro. Archived from the original on 25 December 2010. Retrieved 22 May 2011. ^ "Need For Speed: Hot Pursuit Review for the PS3". Gamerevolution.com. 30 November 2010. Retrieved 22 May 2011. ^ "Need for Speed: Hot Pursuit". Games Master (Print). UK: Metacritic: 63. November 2010. ^ a b "Need for Speed: Hot Pursuit Review for PlayStation 3 - GameSpot". Uk.gamespot.com. 19 November 2010. Archived from the original on 4 December 2010. Retrieved 24 November 2010. ^ "GameSpy: Need for Speed: Hot Pursuit Review". xbox360.gamespy.com. 17 November 2010. Retrieved 22 May 2011. ^ a b "Need for Speed Hot Pursuit". GamesRadar. 11 November 2010. Retrieved 11 November 2010. ^ a b "Need for Speed: Hot Pursuit Review". Gamtrailers. 9 November 2010. Archived from the original on 11 November 2010. Retrieved 10 November 2010. ^ a b "Need For Speed: Hot Pursuit Review". IGN. 8 November 2010. Retrieved 8 November 2010. ^ a b "Need for Speed: Hot Pursuit review: More than satisfies the need". Joystiq. 9 November 2010. Retrieved 10 November 2010. ^ a b "Need for Speed: Hot Pursuit". PlayStation: the Official Magazine (US) (Print). US: 70. November 2010. ^ a b "Need for Speed: Hot Pursuit". OXM. 20 November 2010. Retrieved 10 November 2010. ^ a b "Need for Speed: Hot Pursuit". OXM UK. 27 November 2010. Retrieved 2 December 2010. ^ "Need for Speed: Hot Pursuit review". PC Gamer. 23 December 2010. Archived from the original on 3 January 2011. Retrieved 22 May 2011. ^ a b "NFS Hot Pursuit Review". VideoGamer. 10 November 2010. Retrieved 10 November 2010. ^ "Review: Need for Speed: Hot Pursuit - Review". Guardian.co.uk. 16 November 2010. Retrieved 2 December 2010. ^ "Why Need for Speed: Hot Pursuit May Be More Fun Than Gran Turismo 5". Playstationlifestyle.com. 3 December 2010. Retrieved 23 December 2010. ^ "Racers back at pole position". MCV. 22 February 2011. Archived from the original on 25 February 2011. Retrieved 23 February 2011. ^ "Black Ops Leads UK Charts, Assassins Creed: Brotherhood Hits Number Two". Gamasutra.com. 22 November 2010. Retrieved 2 December 2010. ^ "UK Sales Charts: Gran Turismo 5 Slipstreams Call Of Duty: Black Ops, Takes The Top Spot". Pushsquare.com. 29 November 2010. Retrieved 2 December 2010. ^ "Black Ops tops UK charts this holiday, NFS: Hot Pursuit gets sales boost". Joystiq.com. 20 December 2010. Retrieved 20 December 2010. ^ "Black Ops Leads UK Sales, Cataclysm Vanishes From Charts". Gamasutra.com. 20 December 2010. Retrieved 20 December 2010. ^ "UK Software Charts: FIFA 11 holds onto No. 1 for week of January 8th". el33tonline.com. 10 January 2011. Retrieved 17 January 2011. ^ "UK Charts: LittleBigPlanet 2 arrives at the top". Fregland. 24 January 2011. Archived from the original on 18 July 2011. Retrieved 3 February 2011. ^ "UK video game sales chart". The Telegraph. 31 January 2011. Retrieved 3 February 2011. ^ "NPD Results, November 2010: Industry Up 8 Percent; Black Ops Leads Software". Gamasutra.com. 9 December 2010. Retrieved 11 December 2010. ^ "NFS: Hot Pursuit races to 400k in the US in November". Joystiq.com. 10 December 2010. Retrieved 11 December 2010. ^ "New Need For Speed Sells 417K At U.S. Retail In November". Ganasutra.com. 10 December 2010. Retrieved 11 December 2010. ^ "Need for Speed: Hot Pursuit shifts almost half a million in the US". play.tm. 10 December 2010. Archived from the original on 13 December 2010. Retrieved 11 December 2010. ^ "Need for Speed: Hot Pursuit helped keep the racing genre alive in 2010". Gamertell.com. 21 December 2010. Retrieved 23 December 2010. ^ "NPD December 2010 – Xbox 360 sees YoY increase with 1.86 million units, Black Ops is software winner". feedthegamer.info. 14 January 2011. Archived from the original on 21 July 2011. Retrieved 14 January 2011. ^ "Electronic Arts Reports Q3 FY11 Financial Results". EA.com. Electronics Arts. 1 February 2011. Archived from the original on 8 February 2011. Retrieved 23 August 2015. ^ "Medal of Honor, Hot Pursuit ship 5 million". GameSpot. 1 February 2011. Archived from the original on 2 March 2014. Retrieved 3 February 2011. ^ "EA: Medal of Honor and Hot Pursuit crossed 5 millions sales figure mark". GamePur. 1 February 2011. Retrieved 3 February 2011. ^ "Need for Speed sales improve dramatically post-launch". Huliq. 3 February 2011. Retrieved 3 February 2011. ^ "Analyst: EA's Need For Speed: Hot Pursuit Could Sell 4.2m During Holidays". Gamasutra.com. 4 November 2010. Retrieved 8 November 2010. ^ "Need for Speed: Hot Pursuit to Sell 4.2 Million, Generate $185 Million, says Analyst". Gamasutra.com. 4 November 2010. Archived from the original on 11 November 2010. Retrieved 8 November 2010. ^ "Hot Pursuit Named Best Racing Game by E3 Game Critics!". Needforspeed.com. 6 July 2010. Archived from the original on 13 July 2010. Retrieved 13 December 2010. ^ "Hot Pursuit Wins Big At E3". Needforspeed.com. 10 August 2010. Archived from the original on 15 September 2010. Retrieved 13 December 2010. ^ Keyes, Rob (12 December 2010). "2010 Spike Video Game Awards Winners List". GameRant.com. Retrieved 12 November 2010. ^ "And The Winner Is." Needforspeed.com. 13 December 2010. Archived from the original on 16 December 2010. Retrieved 13 December 2010. ^ "Best Driving Game". GameSpot.com. 22 December 2010. Archived from the original on 17 December 2010. Retrieved 22 December 2010. ^ "Best Racing Game". 1UP.com. Retrieved 2 February 2010. ^ "Racing Game of the Year". GameSpy.com. 23 December 2010. Retrieved 23 December 2010. ^ "Best of 2010 Awards: Racing". Shack News. 28 December 2010. Retrieved 11 January 2010. ^ "VGChartz - Game of the Year". VGChartz. Archived from the original on 31 December 2010. Retrieved 24 April 2011. ^ "Best Racing Game". GamesTrailers.com. 20 December 2010. Retrieved 20 December 2010. ^ "2010 GR Awards: Best Racing Game". GameRevolution.com. 22 December 2010. Retrieved 23 December 2010. ^ "Best of 2010". IGN.com. 13 December 2010. Retrieved 14 December 2010. ^ "Hot Pursuit is the Best Competitive Multiplayer Game of 2010!". Needforspeed.com. 17 December 2010. Archived from the original on 20 December 2010. Retrieved 19 December 2010. ^ "The Platinum Chalice Awards 2010". Gamesradar.com. 18 December 2010. Retrieved 19 December 2010. ^ "Giant Bomb's Game of the Year 2010: Day Three". Giant Bomb. 29 December 2010. Retrieved 11 January 2010. ^ "Giant Bomb's Game of the Year 2010: Day Two". Giant Bomb. 28 December 2010. Retrieved 11 January 2010. ^ "Giant Bomb's Game of the Year 2010: Day Six". Giant Bomb. 1 November 2010. Retrieved 11 January 2010. ^ "Gamereactor" (PDF). Gamereactor. 23 December 2010. Retrieved 3 June 2011. ^ "Racing Game of the Year". AIAA.com. Retrieved 11 February 2010. ^ "Need for Speed: Hot Pursuit wins at the BAFTAS". ^ "News: Golden Joysticks 2013: Full list of winners - ComputerAndVideoGames.com". Goldenjoystick.com. 25 October 2013. Retrieved 23 November 2013. ^ "Hot Pursuit Nominated for 'Favorite Videogame' at 2011 Nickelodeon Kids' Choice Awards!". NeedforSpeed. 28 February 2011. Retrieved 24 April 2011. ^ Cullen, Johnny. "LBP2, NFS: Hot Pursuit, Angry Birds among Kids BAFTA nominations". VG247. Retrieved 23 November 2013. Wikimedia Commons has media related to Need for Speed: Hot Pursuit. This page was last edited on 22 April 2019, at 15:04 (UTC).